A digital file rename software to quickly rename many digital photo files and picture files. 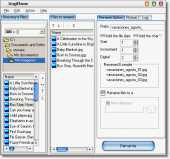 MagiName is a digital file rename software to quickly rename many digital photo files and picture files. File names of digital photo files generated by digital cameras, such as "DSCF0010", "DSCF0011" are annoying. These file names make no sense. We need a file name that can remind us what the photo or picture is. MagiName can help you rename these annoying digital photo file names quickly. MagiName is a must-have handy file rename software for digital camera users. Batch-rename names of digital photo and picture files<br> Rename many photo files with one click. You can select rename different photo files in different folders. Preview photo files before adding to rename file list. An example will show how the file names will be, when changing some options. Insert the file creation date into each renamed file names, eg Jordan20001031-003. The starting counter number, increment of counter and the number of counter digits can be set. You can rename original files in their original folder. Also you can choose to copy files to a different folder and rename files in the new folder.